5 string banjo... for basic picking and fill in work and general background atmosphere.. Various blues harps in C- D - and A. Though not an instrument , I use magix studio 12 ( similar to audacity) for mixing and recording to either MP3 or wav format . Also a mandolin on which I know basic chords and a basic bit of picking if needed to blend in rather be lead . Accoustic steel string guitar . evsy no need to shout use lower case type and it will take me some time to add all these items ok? 5 STRING BANJO ... FOR BASIC FILL IN WORK AND GENERAL BACKGROUND SOUND. ALSO VARIOUS BLUES HARP IN C - D AND A . THOUGH NOT AN INSTRUMENT I USE MAGIX STUDIO 12 FOR MIXING AND RECORDING TO EITHER MP3 OR WAV FORMAT . ALSO A MANDOLIN WHICH I KNOW A FEW BASIC CHORDS AND CAN WORK OUT A BIT OF PICKING IF NEEDED TO FILL IN OR BLEND IN BACKGROUND - ENOUGH TO BLUFF MY WAY THROUGH WITH IT ETC . ACCOUSTIC 6 STRING YAMAHA STEEL STRING GUITAR . 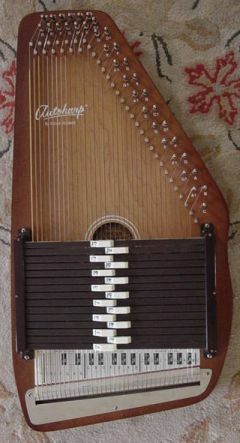 Autoharp looks like fun. But I have enough instruments to work with now with mandolin and banjo; I really want to get a concertina though. I just finished building a Lyre too, 7 strings and made of maple its fun to play around with. Are you offering your services to record your instruments to help others complete or enhance their recordings? If so Russ will add you to list in the 'Sticky' at the start of this section..
Are you offering your services to record your instruments to help others complete or enhance their recordings? If so Russ will add you to list in the 'Sticky at the start of this section.. Sorry, got excited when I saw the picture, I didn't realize this was connected with the networking thing! I probably should have read the threads above it I guess. This clears things up some anyway, I was wondering why this was in the Recording forum. I need to get more "social" with my playing and join a few real jam sessions before I offer my services for recording. You can delete the useless post if you want, I will pay more attention next time. I have just noticed that I am still listed for the autoharp. Sadly it was stolen when I was burgled last year and I forgot to ask you to remove me from the list so will you pleased so now.